The afternoon sun in a blue sky streamed down on us in late November 2013, when I visited Master Jia Ji in Foshan City, Guangdong, Southern China. I was being driven by Master Zhi Jiu Chen, and his student, Alan Feng, who served as my translator. This Wan Nian Yun tree was created in 1998 by Master Ji. It is named “Prince and Showgirl” and is in a rectangular pot 1.5 (4’11”) by 1 (3’3”) meters. The tree is 1.48 (4’10”) meters. In April of 2012, it received the Golden award of the Guangdong, Hongkong, Guangxi 25th Annual Penjing Exhibition. Master Ji with Prince and Showgirl tree. 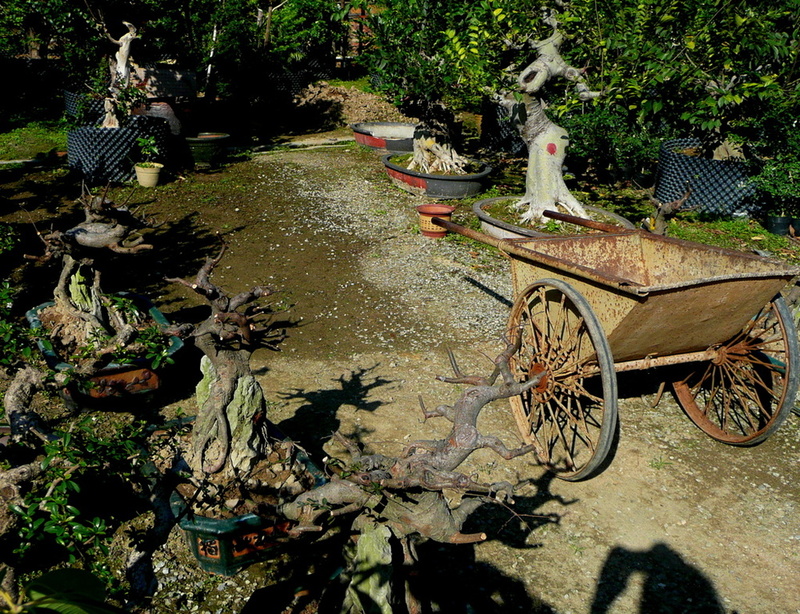 Ji’s nursery garden is devoted to production. A small office sits at the end of the driveway in the middle of a suburban lot. Trees in every stage of development occupy every square inch, grouped in blocks and rows in the ground. The large specimens sit on hefty pedestals around the margins. Master Ji spreads branches aside to accommodate my camera, proudly displaying his most awarded tree, a Ficus ‘Yong Shu’ in the Lingnan southern style. The front received first place gold, the highest award given. At another exhibition, the tree received another highest award for the back side. 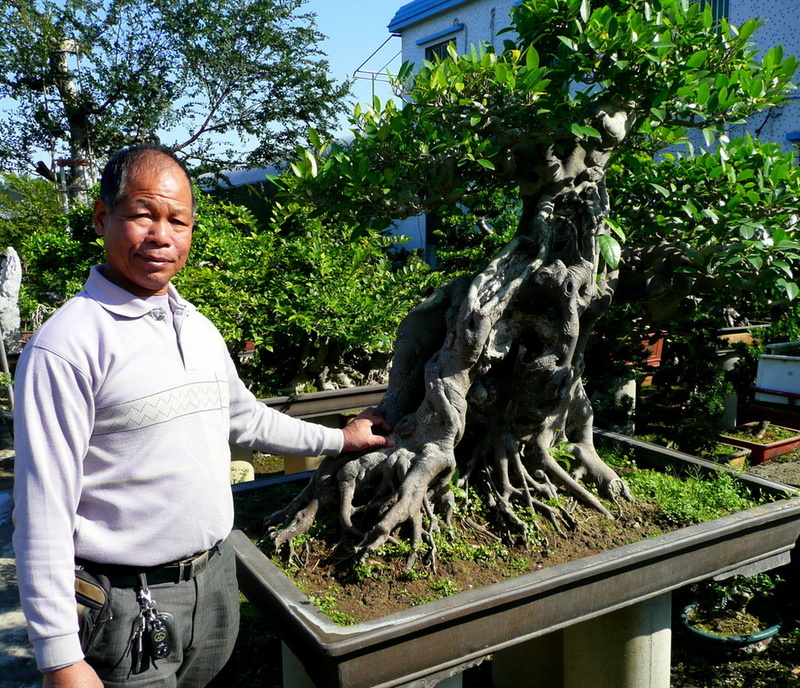 Master Ji is recognized throughout China and Southeast Asia for his advancement of the art of penjing by promoting two-sided trees. One side of the tree is called Lu xuan deng, and the other side of the tree is Xue song ya deng. Master Ji explained through the translator, Alan, the main characteristic differences between Chinese penjing and Japanese bonsai: Chinese style is more natural and a large size, original, “like a poem full of emotion and imagination.” There is less emphasis on following specific rules and more on bringing out the spirit of the tree. “All of Chinese culture connects in penjing, coming from the heart,”says Ji. And there are geographic differences. China comprises a large area—east to west and north to south—encompassing a variety of stylistic approaches and tree varieties distinct from each other. After touring the nursery with his two sons, Jian Chang Ji, 32-years-old, and Jian Ye Ji, 25-yearsold, we retired to the office and enjoyed conversation with ma pi cha tea from 1960, dark brown, large flakes. Master Ji showed us several of his tea collections including 1971 Pu erh tea from Guangdong Yingde County. Master Ji has received numerous awards. The red and gold velvet boxes are stacked like cordwood. He has been exhibiting for the past three years. I asked him, what’s your motivation to exhibit? He answered, love of penjing, a promotion to build his business so that his two sons will be able to follow him and lastly to promote the tradition of Lingnan style from his old teacher Laoshi Xie Ming Lu, (1922-2006), a originator of the Lingnan style. Master Lu’s contribution to the development of penjing is the creation of a “water-film type” and “weeping willow type” tree. His style of a large floating branch and another large back branch established the look of elegance and balance of the Lingnan penjing style. 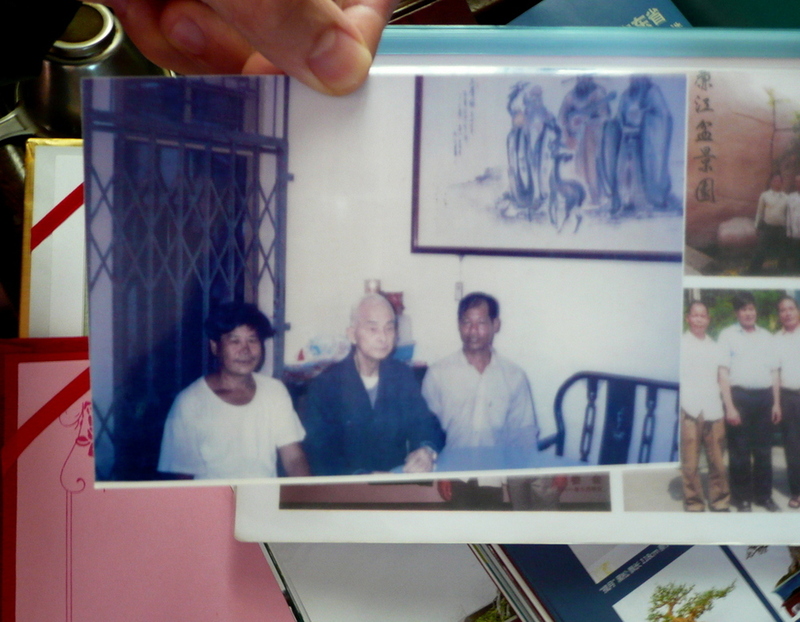 Ji studied with Master Lu for three years at Lu’s Garden, located at the First Production Team at Hua Di Wan. Ji first met Lu at the Lingnan Penjing Training Course in 1983. That’s when he decided to start his own Jia Ji Garden. It is located in the Flower Garden on Longxi Road, Liwan District, Guangzhou, China. This is where he is developing his own “S” style or “dancing style” with radiating branches like the spokes of a wheel, but try to imagine the spokes wavy and not straight and with the trunk kinked and slanted to one side. Master Ji’s advice to beginners is to observe more of nature and how trees grow. To help newcomers to the hobby he gives free workshops. His advice for exhibition is to pay attention to the placement of branches, grafting when necessary, cutting back and inserting bark grafted, small, pencil sized or smaller, cuttings under the cambium. Oldest living penjing specimen dates back 369 years to the Ming Dynasty and is located in Jiansu province. The Yihe Garden at the Summer Palace near Beijing houses national treasure penjing. Cloud style or yang style is named for a town near Shanghai: Yang Hou.